An award-winning women’s health campaigner has joined forces with an NHS Trust to help tackle period poverty. 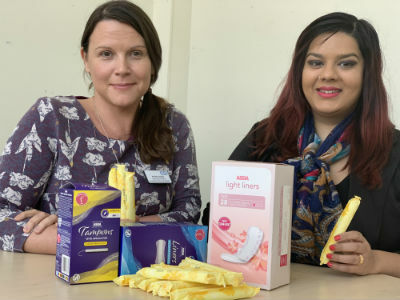 Neelam Heera, who was given a Special Recognition Pride of Birmingham award, is working with Sandwell and West Birmingham NHS Trust (SWBH) to promote the availability of free sanitary products for patients and staff. Neelam, 29, who runs the charity Cysters which helps to spread awareness of reproductive health among Black Minority Ethnic (BME) women, said of the partnership: “Cysters is really pleased to be working with the Trust. “We have already been actively working within the community to tackle period poverty by supplying donated products to those who need them most. Period poverty is on the rise in the UK and Sandwell and west Birmingham is known to be one of the most deprived areas in the country meaning that many people will be struggling financially and not be able to afford to buy period products. This deprives them of their dignity and makes their lives difficult. Nationally period poverty affects one in 10 women, with one in seven admitting to having had to resort to borrowing menstrual products from a friend, or use tissues or towels to manage their periods. Sandwell Council is also working with the Trust to create a Period Positive Borough, and is rolling out free period products in all secondary schools. Raffaela Goodby, Director of People and Organisation Development, who is advocating the period poverty campaign added: “We are really delighted and honoured to be working with Neelam and Cysters. I’m excited about how our partnership will reach the different communities in our area. “The aim of becoming period positive is to provide free and readily available period products to those who can’t always afford them. Local suppliers have been keen to join the campaign, with Asda Great Bridge working with Your Trust Charity, which is the registered charity for SWBH, to donate products. From April signs will be on toilet cubicle doors across the Trust indicating where the products are available.